Emma Carew Grovum thinks part of being a journalist is giving back. Carew Grovum, a ThreeSixty Journalism alumna and product manager at The Daily Beast, spends time coaching, speaking and training aspiring and current journalists. As a high schooler, Carew Grovum wanted to become a newspaper reporter and storyteller for her community. Driven by her passion, Carew Grovum signed up for ThreeSixty Journalism in 2002, at age 15. Being in the program further inspired her. After the ThreeSixty program, Carew Grovum studied journalism at the University of Minnesota. When she graduated, she relocated to New York and stayed. Carew Grovum further connected with AAJA, a national organization that focuses on media diversity, coverage for communities of color and advancements of Asian American journalists. It elevated her interest in those topics. As a Korean adoptee, Carew Grovum is a strong advocate for media diversity and accurate portrayal of communities of color. As a product manager at The Daily Beast, Carew Grovum works with software engineers and designers. 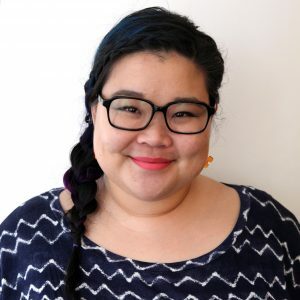 Her job ranges from building tools for the newsroom, managing how editors publish stories to the web, to designing and formatting newsletters. “My job is very broad in looking at how journalism is at the very least distributed, to all audiences, and how it’s produced and published to our website,” she said. Carew Grovum also coaches women in journalism through the Digital Women’s Leadership program. She helps those involved in any part of the journalism landscape with resumes, cover letters and transitioning from the newsroom to the product side. She utilizes her skills and experiences to advise journalists on how to navigate the situation of being one of a few journalists of color in a newsroom. “Even since my first job at the Star Tribune, training has been a large part of all jobs I’ve ever held, so whether it’s teaching journalists about Twitter, social media or training reporters in my newsrooms about data journalism,” Carew Grovum said. For a person who loves to give back, and as a former ThreeSixty Journalism student, Carew Grovum gives this advice for current students and aspiring writers: practice, practice, practice, early and often. This advice is aimed at ensuring a bright future in a rapidly changing profession. Carew Grovum said she isn’t sure what her next chapter will be, but for now, she’s just enjoying it for the moment.